I cook for a living. I write about food. I manufacture food. I serve food. I shop for food. I take inventory of food. Food is all around me, in essentially every aspect of my life. I always have to laugh when friends ask what I cook for myself. You see, I rarely cook for just me. It’s too much like work. But this year, there’s a new sheriff, er, budget in town. So I’ve been preparing my meals all week. Side note: I’m always suprised to see 1) how much weight I lose when I cook for myself, and 2) how much money I save. My mantra to dine-in lasted five days. Last night, unable to stand the thought of continuing on with my 12-hour day in the kitchen, I bundled up and walked to Elysian Brewery in Tangletown on Meridian and 56th. It’s a comfortable restaurant slash pub; and I always feel at ease when I dine alone there. I took a seat at the bar, and ordered a Men’s Room Original Red. Sipping the chilled beer, I scanned the menu repeatedly, not registering any of what I was reading. When the bartender came to take my order, I asked if he could just pick for me. His blue eyes got wide, and he asked, “Anything?” I pointed to the appetizer portion of the menu and said pick anything from there. (Elysian’s appys are like meals in and of themselves!) He looked intrigued, and asked if there were any no-nos. I assured him I would be fine with whatever he selected. Grateful that I didn’t have to make one more decision, I watched a bit of the Lakers game on the television in the corner, and finally relaxed after a long, unrelenting day of decisions, choices, number crunching, and deciphering legal lingo. I found myself watching as the bartender constantly stayed in motion, pulling tabs, shaking cocktails, pulling glasses from the Hobart sanitizer. I wondered if he ever gets to the point in his day when he wants someone to just pour him a drink. A server approached from behind, with a bowl inverted over the top of another bowl, and a small plate with three slices of french bread. I smiled. I eagerly removed the top bowl to reveal a steaming bowl of eroticly-enticing mussels. 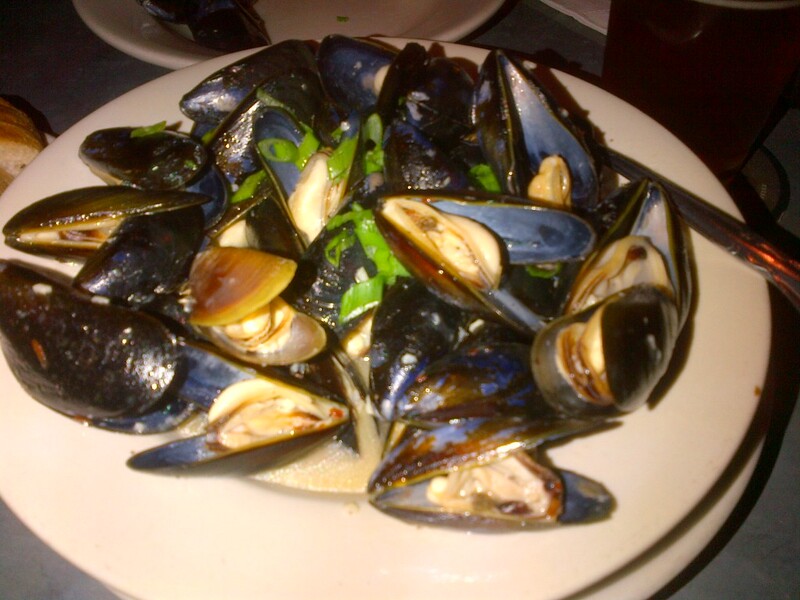 Visually, a mussel is so seductively suggestive, with the provocative meat between the gaping shells. I picked up the small seafood fork and took one of the shells, gently easing the mussel away out of its nestled spot and slowly slid the dripping meat into my mouth. The flavors of white wine, butter, garlic, and scallion were a perfect match for the tender mussel. I looked up and smiled at the bartender who was watching to see if I approved of his choice. “Well done,” I smiled at him. The delectable feast was all mine. I dipped my crunchy bread into the amazing sauce, and slowly worked my way through the bowl of mussels. Satiated and just a little intoxicated from the succulent morsels, I relaxed the last little bit and eyed the 10-year-old Laphroaig Scotch behind the bar. It was served to me neat. A peaty-smoky aroma lit my senses ablaze, and I rolled the first sip over my tongue, and the warm liquid carved a molten path down my throat. The evening, the meal, the beverages were perfect. On my credit card slip, I thanked the bartender for a lovely dinner and told him how adorable he was. I may have written down my phone number too…but that was the mussels talking. Well, that and the beer, and the Scotch and Jarrod’s incredible blue eyes.